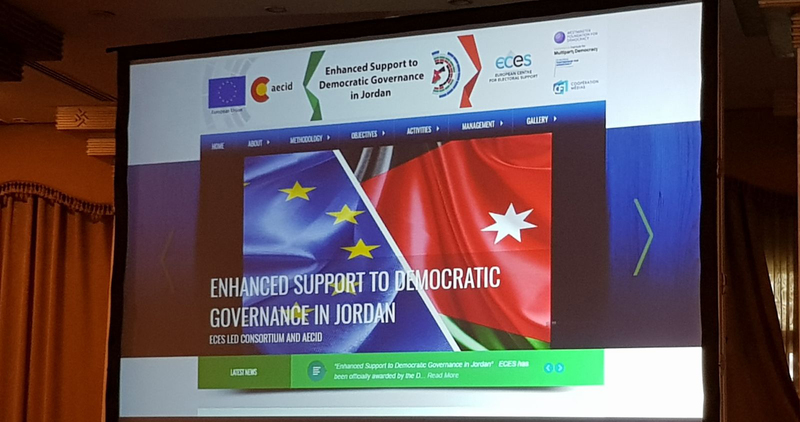 The programme, which is entitled, “is EU Support to Jordanian Democratic Institutions & Development (EU-JDID)”, is funded by the European Union and implemented by a Consortium led by the European Centre for Electoral Support (ECES) and composed of the European Partnership for Democracy (EPD), the Westminster Foundation for Democracy (WFD), the French Agency for Media Cooperation (CFI) and NIMD. The programme was launched on 24 May in Amman, Jordan. The ceremony was attended by the different actors working on the project, as well as representatives of the EU and the Jordanian Parliament. Opening speeches by the Ambassador of the European Union to Jordan, H.E. Andrea Matteo Fontana, and the Ambassador of the Spain to Jordan, H.E. Santiago Cabanas Ansorena, kicked off proceedings. Participants then heard from Jordan’s Minister of Political and Parliamentary Affairs Musa Maaytah, the First Deputy Speaker/Action Speaker of the House of Representatives Khamis Atieh and the Chair of the Independent Electoral Commission, Khalid Kalaldeh. These representatives presented the programme from the point of view of the beneficiary institutions. The programme was then presented from the standpoint of the implementing organisations, with speeches from ECES and AECID. Support to the political party system: support the political party system in contributing to democratic governance and policy making in particular in the House of Representatives. NIMD is implementing the third component, political party support. The programme will support interparty dialogue platforms, which are safe spaces for political parties to meet and discuss issues. In addition to facilitating the set-up of these spaces, the project will also proactively facilitate the debate and ensure the inclusion of all relevant actors, including MPs, women and youth candidates. In addition, the programme will aim to strengthen political parties in internal management and organization, and support the participation of women and youth in political life in general. With this multi-faceted approach promoting stronger institutions and building bridges between elected institutions and citizens, we hope to support Jordan’s reform process towards consolidation and deepening of democracy. More on the programme’s approach and ambitions here.